Welcome back to my blog! I have a shaker card to share with you today using Joesph’s Coat technique. 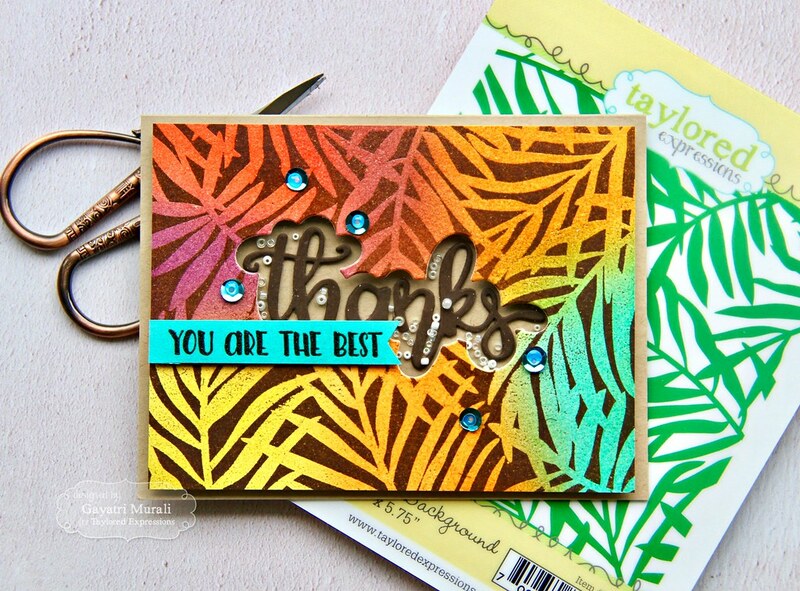 have used the new Taylored Expressions Tropical Fronds Background stamp for Joesph’s Coat technique. Here is the card for you. I started with sponging distress inks on a Sugar Cube panel. I used Peacock Feathers, Wild Honey, Crushed Olive, Seedless Preserve, Ripe Persimmon, Spiced Marmalade and Aged Mahagony. I chose a lot of autumn colours to sponge the background panel. Then I dried the panel using heat gun. The panel has to be bone dry because we don’t want the embossing powder to stick all over the panel. 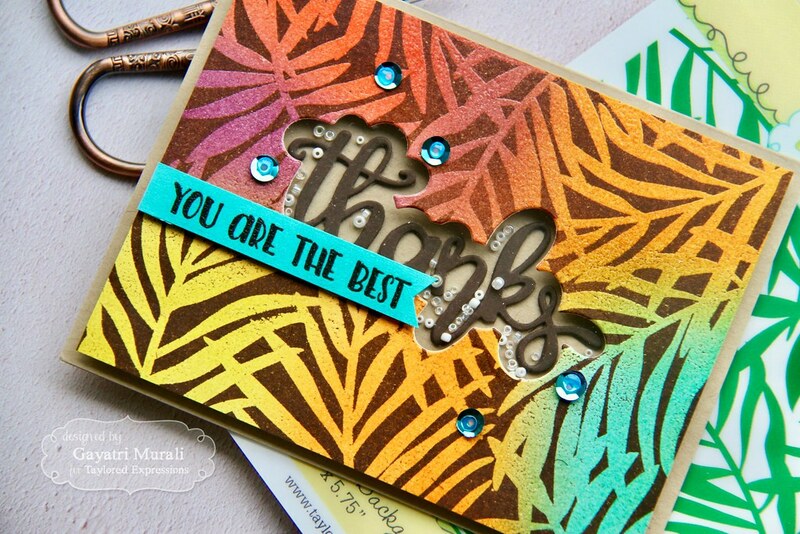 Then I stamped the Tropical Fronds background image on the panel using versamark. I used MISTI to stamp and get even coverage. Clear heat embossed the image using TE’s clear detailed embossing powder. Then I used Gathered Twigs and Ground Espresso distress inks to sponged the entire panel. The embossed image traps the colours under the image and resists the brown distress inks. So you see the coloured fronds with the brown background. This is such a beautiful technique. The result is gorgeous. There are colours under the embossed image, texture from the heat embossing and the contrast from the dark background. I love love how this turned out. I trimmed the panel to 4’x5.25′ in size. Using the Thanks Script Backer die, I die cut the centre of the panel. Then I added acetate on the back of the panel, added double foam tape around the panel to make a shaker box. I die cut three Thanks Script die, stacked and glued them to make dimensional die cut. I adhered this die cut on the centre of the Toffee card base using the main panel as guide. Then I added some TE Shaker Filler and adhered the shaker panel to make the shaker card. 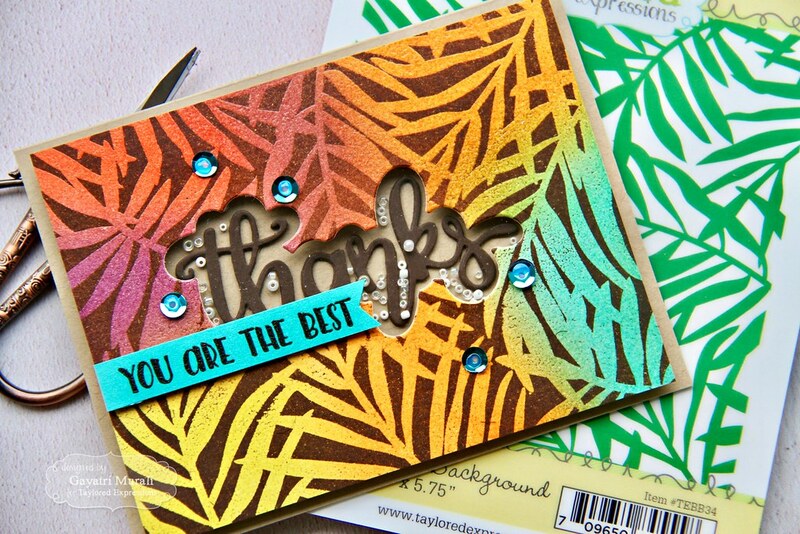 The secondary sentiment is from Cutting Edge Flowers stamp set. 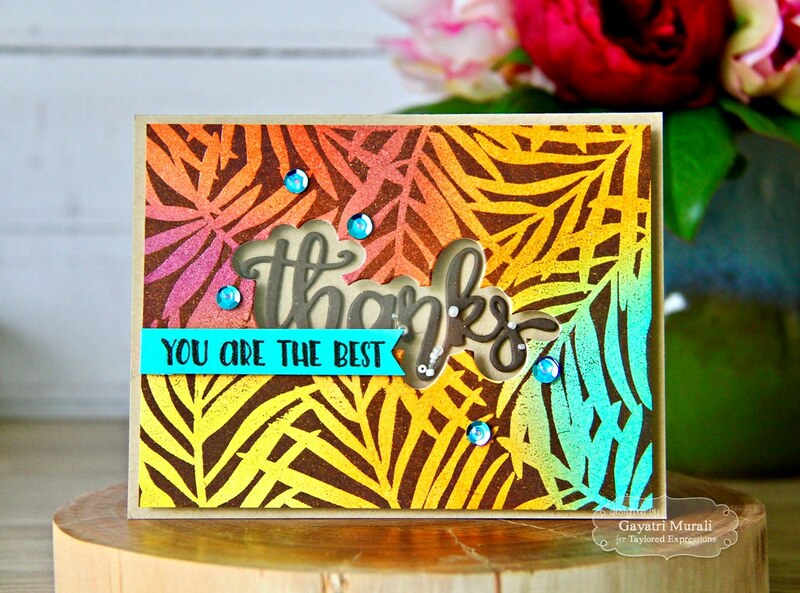 I brown heat embossed the sentiment on a strip of Cookie Monster cardstock. 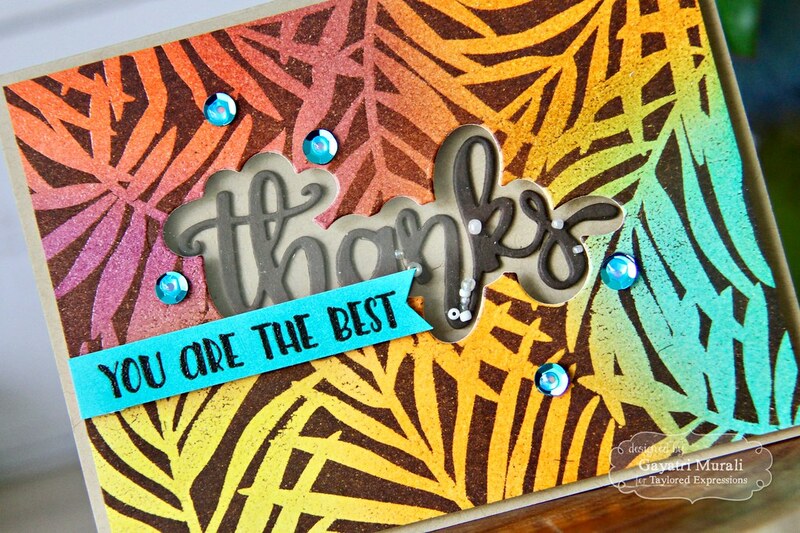 I stamped the sentiment using TE Chocolate Truffle TE hybrid ink followed by versamark and then clear heat embossed using TE’s clear detailed embossing powder. I trimmed fish tail on one end and adhered using foam adhesives. Then finally embellishing with blue metallic sequins from TE sequins collection. 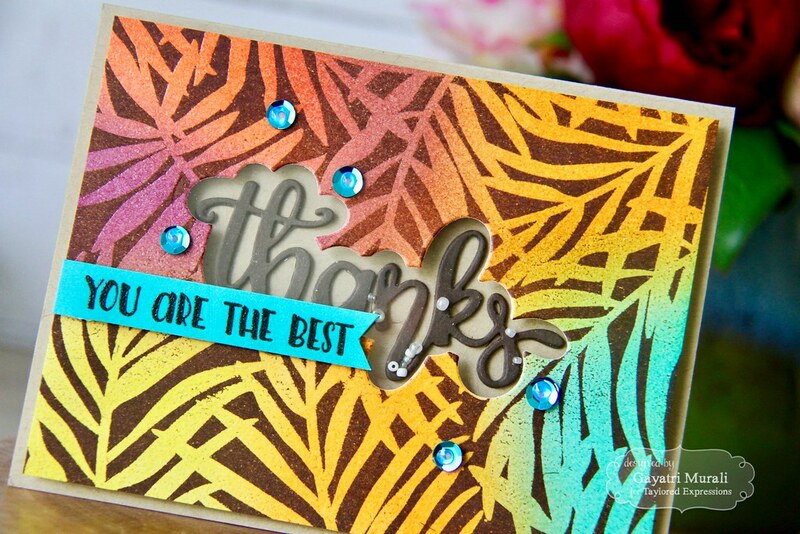 Wow, gorgeous card, love the vibrant colors! Your card is stunning! Thank you for sharing it with us and explaining the technique you used to get this look, I love it. Oooh, this is beautiful!! Love it!